The roll call of muses in fashion’s pagoda is an exclusive and rapidly evolving list. Yet there is one perennial style icon who has courageously weathered the tough adaptation of the times and has been modeled by designers in recent years. As the face of Nirvana, Kurt Cobain was at the focal point of grunge, a movement that revolutionized the cultural landscape of the ’90s, and one that continues to reverberate in style today. Grunge pulls liberally from both spectrums of a woman’s and man’s wardrobe, mingled with a thrift-store look. In disheveled jeans and blackout schemes, this revolutionary style softens the tough exterior of the archetypal rebel from within, and sets the ball in motion for a profound millennial idea of androgyny. 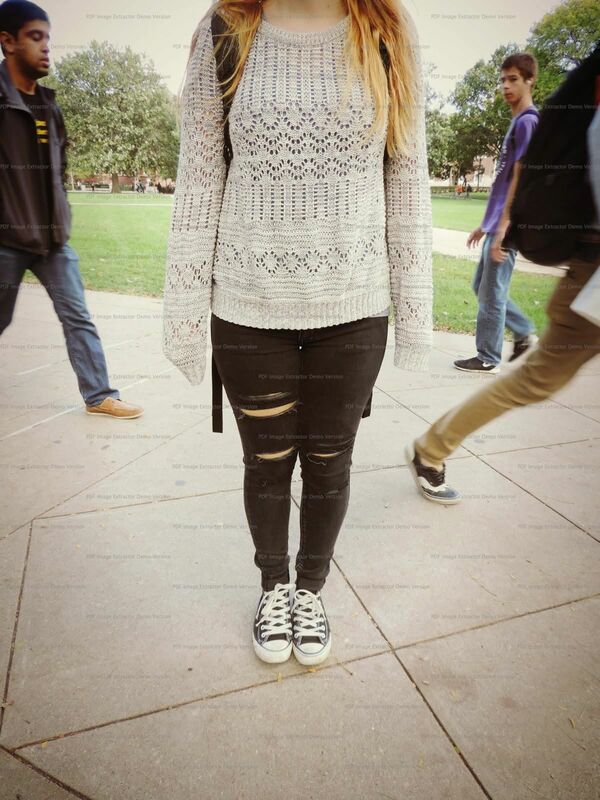 Just in time for fall, UIUC fashion has also taken a cue from the crisp Chambana weather—circa Cobain. 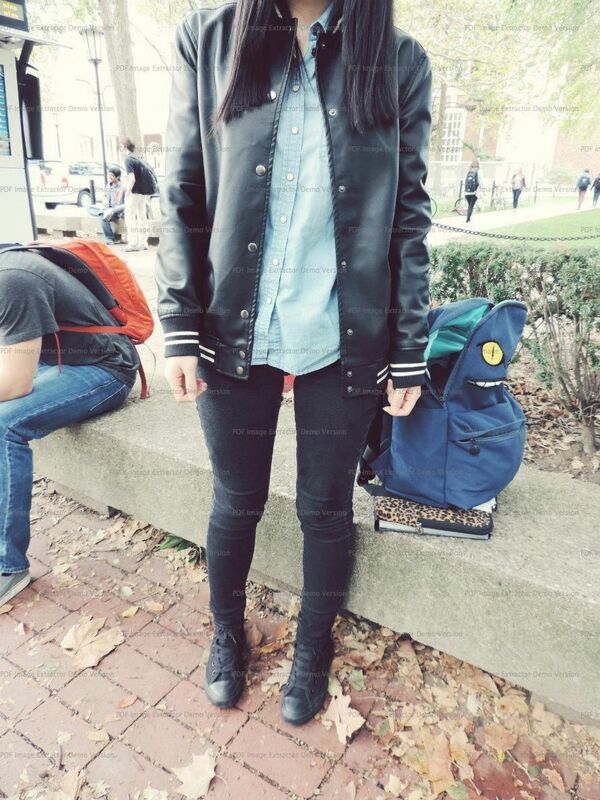 UIUC campus beware—’90s grunge fashions are back in vogue this season. Channel your angst-ridden teen spirit with layer-worthy flannels, floral frocks and scuffed Dr. Martens. This ensemble is the epitome of grungy street fashion. 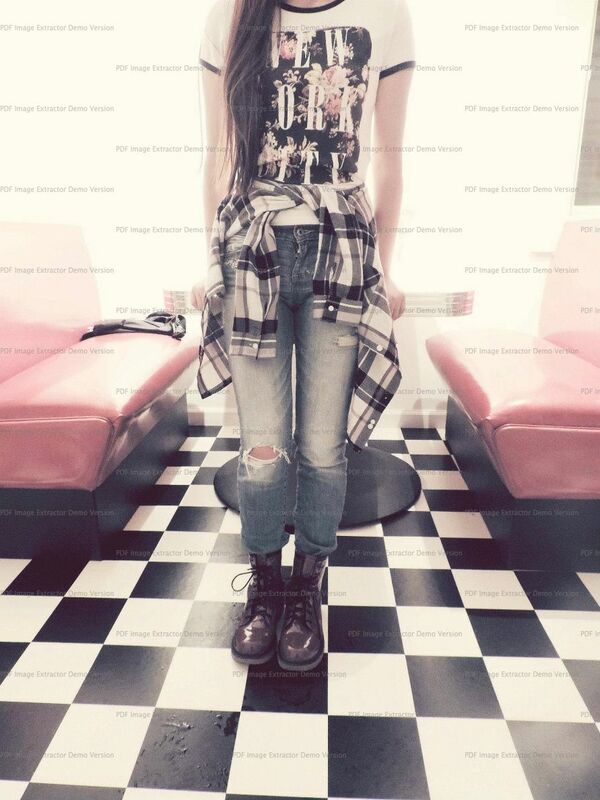 One of the most recognizable elements of grunge fashion is the plaid flannel shirt. Usually oversized and worn untucked, it can be layered over a graphic T-shirt or long-sleeved thermal undershirt. Back in the time, plaid was often transferred to shirts, but nowadays with the modern twist, plaid is also transferred into skirts, pants, bags and even shoes. Tie a plaid button-up over your waist for an even more unkempt vibe. The plaid patterns on these shirts are usually relatively large in scale, the colors muted and the fabric faded and worn. Jeans are another important element. Most of the time, jeans are well worn-in, with rips or holes to accompany the stressed look. Pair with your favorite color of Dr. Martens to complete the look; this particular ox-blood pair is the cherry on top of the grunge sundae. Less brawny than a biker jacket and less coy than a boyfriend sweater, the varsity jacket is an optimal piece whenever you are up for a good time. This season’s version is cut far leaner than the traditional one—plus the details (rows of buttons, a zippered pocket) update the classic. This Fashionista’s varsity jacket caught my eye for its leather fabric. Nothing is more appealing than pulling off an all-black outfit. If complete blackout is a little overwhelming, try sneaking in a hint of color, like this denim shirt. Paired with a pair of black denim skinnies and black Chucks, the tough masculine aspect of the look is achieved whilst maintaining a tinge of femininity. If you’re a traditionalist, choose a varsity jacket in a classic style. Black, navy, red and cream colors are all timeless and versatile. *Personally, I prefer this season’s varsity jackets minus any lettering and fuss-free cuts. When looking at how to style a varsity jacket, team them with indigo denim, cropped trousers or pencil skirts for a classier look. Some people may be hesitant of being fashionable because they mistakenly associate ample style with a lack of comfort. Jeans, for instance, are the savants of casual styling and an immortal trend; they will never go out of style. Season after season, they inevitably return with current and innovative riffs that keep the classic pant consistently contemporary. This fall, the denim dossier includes many styles to take for a spin such as white jeans (trashing the Labor Day theory), boyfriend or the high-waisted pant, but for this installation, our focus will start with the seemly tough, casually chic ripped jean. On this Fashionista slashed denim is an integral component in an outfit that looks distinctive, but is deceptive in that it will easily adapt to any personal style. The trick is that it takes a common framework and transforms it with the addition of feminine pieces. Waffle-knit and alpaca blend sweaters are very trendy and add a beautiful touch to the rather rebellious pant. The softer fabric of the sweater mixed with the masculinity of the bottoms create an androgynic balance. For more transparent sweaters, wear a bandeau as a foundation. This Fashionista’s black bandeau and classic Converse continue the consistency of the color scheme, loudening the voice of the jeans. Sporting a snug outfit that still looks effortlessly assembled, this Fashionista wears a dark color scheme to show off her urban and edgy style. In this outfit, she is wearing a leather jacket with a knit pullover. Trendy accents like shoulder straps and belt buckles merely announce a surface affection, a sampling of a vibe. Take a cue from your inner bad bone and go all the way rebellious with a black leather jacket. In its 100-year history, the outerwear has withstood the roadway and the runway. Aviators, rebels and the fashion elite have lent it symbolism, making it an American style statement piece. Whether oversized or moto style with asymmetrical collars, leather jackets spice up every outfit. It’s a closet staple that should occupy any smart sartorialist’s closet. To perfect the layered look, this Fashionista also pairs her monochromatic look with a collared floral shirt, black skinnies and elevated booties. An all-black ensemble lends itself nicely to a casual look that can be suitable for any occasion. The absence and consistency of the color also make it very easy to mingle black attires with other fabrics and textures in the outfit. Black and white is such a versatile and trendy combination and can change any woman into a smart-looking Fashionista. It’s a classic color blend that can make you look effortlessly chic and sophisticated. Black and white outfits carpeted the runways for fall, and celebrities like Cameron Diaz and Blake Lively have been rocking the classic color combo this season. The monochromatic trend has a very sharp aesthetic that exudes a stylish effect that never goes out of style. Try out a blend of upbeat and elegant by infusing texture and pattern into your white/black outfit. An eye-catching, black textured cardigan will look sublime over a cute white top. A graphic knit pullover will look daringly fetching paired with a rougher black denim. As shown, don’t shy away from loud patterns; they look stunning when paired with solid colors and when presented in the classic black/ white sequence. Athleticism is a popular trend, and outfits integrating racer necklines, geometric shapes and straight lines offer a sportier finish. Keep it elementary and minimalistic while paying attention to functional details, like buckles and zippers. Ragged clothing portrays one of the more interesting aspects of the ’90s grunge look. Of course, we should have known what to expect from New York Fashion Week, the style world’s “Oracle of Delphi.” Take a cue from Marc Jacobs’ military-inspired show and enter in the military jacket. A timeless piece, this particular one caught my eye from the leather sleeve contrasting, giving off a more unique and rebellious look from the generic military outerwear. Always pay attention to the seemingly minor specifics of a clothing piece; take into the account the adorning pockets and cinching detail that separate this jacket from the rest. A gold striped shirt accents her beautiful long rhinestone necklace, the perfect centerpiece to a simplistic backdrop. 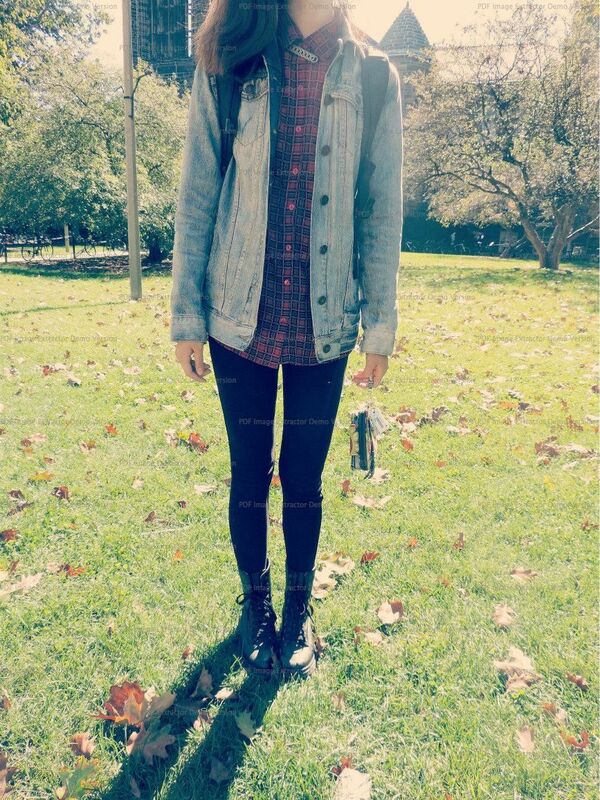 Her light-wash denim jeans further highlights the chic grunge of the ensemble. Her light gray oxford wedges tie the outfit off with a pop of color and a boost of height. From the ’90s to present day, many things have transformed in the fashion cosmos. While jean overalls with rickrack are no longer acceptable to wear to class, jean jackets are persistently inhabiting the runways. Denim outerwear is an effortless way to add layers to some summer favorites. Some of the prominent summer ensembles with jean jackets pair the classic piece with cropped colored chinos or monochrome sundresses. But in the world of grunge circa 1990, the best way to rock a jean jacket is to layer it over a structured plaid shirt, like this Fashionista did. Buttoning the shirt entirely creates a solid foundation for the denim jacket and creates a semblance of stability. Her maroon and red oversized plaid shirt cover just enough to pair it with the ageless black leggings. Shoes and accessories are crucial to embellishing an accentless collection. This smart sartorialist clipped an infinity bib necklace over her buttoned collar and opted for the trustworthy black combats. Pairing shoes and pants of the same color together create an elongating illusion, an ideal solution for gals wishing to establish a lengthening effect.